Loyal readers of the goldwater.com will admit that we have predicted for a while now that centrist parties will soon start to copy the populist anti-immigrant rhetoric and introduce it as policy. Given the success of populist parties during nearly all European elections of 2016 onwards, it is no wonder that both Ms. Merkel (Germany) and Ms. May (UK) are pleading a new mantra as from this week: no more unqualified immigrants. Based upon Canada’s immigration model, the coalition government of German Chancellor Angela introduced new immigration laws in the early hours of Tuesday after a marathon negotiation session which saw the Socialist SPD yield to the demands of Ms. Merkel’s CDU/CSU. Related coverage: <a href="https://thegoldwater.com/news/37984-Germany-Election-Die-Welt-Claims-The-Era-Of-Merkel-Is-Ending"> Germany Election - Die Welt Claims ‘The Era Of Merkel Is Ending’</a>. The new laws will make it more difficult for the poor and uneducated to immigrate to Germany. Although the leftwing Socialist SPD was quick to point out that the deal "adheres to the principle of separating asylum and labor migration," and ensures that “those who have a legal right to claim asylum under German law will still be able to do so,” the German press concluded that it was done to safeguard against an AfD victory in the upcoming election. The conservative CDU touted that non-EU citizens without higher education or, preferably a concrete job offer, will not be able to live in Germany: "We do not want any immigration from unqualified third-country nationals." Like the Canada model, prospective immigrants would be ranked according to the level of education, age, language skills, job offers, and "financial security." In the end, it was Interior Minister Horst Seehofer of the CSU, the Bavarian sister party of Chancellor Angela Merkel's Christian Democrats (CDU) who concluded the deal. Knowing that Bavaria has elections in 2 weeks only, the new immigration laws should come as no surprise. "Skilled workers from abroad are already making an important contribution to the competitiveness of the German economy," the draft reform states. 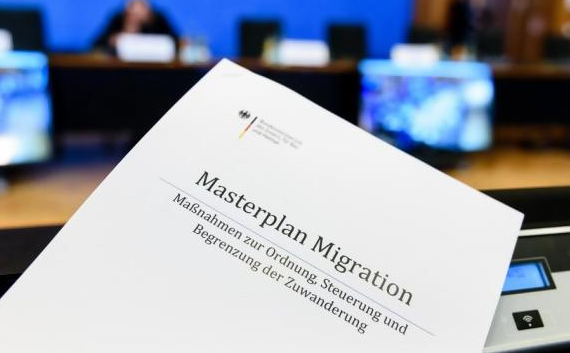 Furthermore, in order to protect sectors it wants to safeguard, the German government will have the right to close off immigration for certain industry categories. I see backflips, loopholes galore coming on that after the elections. And what about the ones there already destroying the countries? I'd be demanding a lot more than what's on offer. Cant trust globalists.